Today is a level 2 snow day. Level 1 is when the public elementary school is closed and Things 1-3 are home from school. A level 2 snow day is when preschool is also closed and Thing 4 is home with her brothers. We have had eleven level 1 snow days so far this year but only a few level 2’s. When there is a snow day, I send an email to work that I am “WFH today” which means I’ll be working from home. I can generally attend meetings by phone, answer emails, and maybe get some actual work done. But that is for a level 1 snow day. 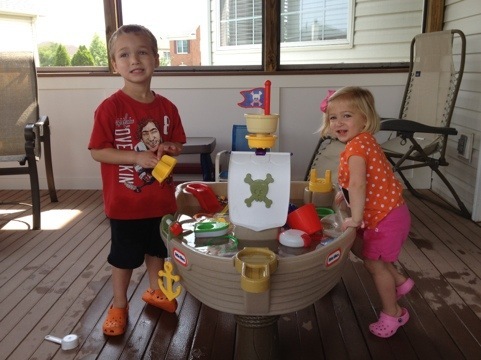 With a level 1 there are several long stretches of opportunity while the kids are in the basement and getting along. There are some interruptions to make everyone lunch, breaking up a few fights, and enforcing some structure like reading or cleaning up time, but otherwise manageable. Level 2 is a different story. Even though I’m officially WFH, the W part is done in quick 5 minute bursts amidst constant interruptions and a noise distraction level as if I were working in the middle of kids birthday party after the cake was served. At some point they will want to go outside in the snow, which is a reasonably quiet stretch I look forward to. But it comes at a price. That price is the aftermath of snow boots and soaking wet gloves and jackets tracked all over the house, and the inevitable fighting and crying when they eventually come in because someone got hit by a snowball or had snow dumped down their back and now they are tired and want food and hot chocolate right now. All of that usually happens precisely when I start a conference call. So, yes, even though I am officially “working” from home today, I do not expect to get anything done. Remember the movie Multiplicity? Starring Michael Keaton, it’s about a guy who clones himself so he can manage all the demands on his time. Go watch it this weekend. How to be in two, sometimes three, places at the same time. This week kicks off the spring sports season. Which means we are juggling practices, games, birthday parties, and other activities on a daily basis. Yesterday we had baseball practice, Tae Kwon Do belt testing, after school and pickup at daycare. Saturday there are 2 baseball practices, belt ceremony, flag football, and a birthday party. And those are just the ones we said yes to. As crazy as our daily schedules have become, it’s actually not as hard as when they were babies and all demanding our time at the same time with a lot of crying. Now it’s more about logistics and how to organize and get everyone where they need to be, and still manage to get the important things done. Like having enough food to eat (4 kids eat a LOT). And having clean clothes for everyone to wear (taking a pair of pants from the bottom of the hamper now and then won’t kill you, I promise). The biggest problem now is being in multiple places at the same time. I need a couple of clones. At least until Thing 1 and 2 are old enough to drive themselves and their siblings. These days everyone has loads of pictures of their kids. ?Pictures from the beach, pictures in the snow, birthday pictures, pictures of little league games, pictures of the first day of school, and everything else that happens every day. ?Our kids’ lives are documented in a Facebook timeline. ?So, how does a parent capture a moment in a way that is timeless and?original? ?By printing a canvas from a photo. I was invited to try a?Printcopia?canvas print. ?Upload an image from Facebook, Instagram, or a file and turn it into a canvas up to 3 feet in size. ? The quality is great and there is something about a canvas print that says piece of art, in a way that framed photos don’t. At Printcopia, you can turn your photos into eye-catching wall art with a variety of printing materials and options to choose from including gallery-quality canvas, sleek acrylic, and glorious panoramic printing. ?If you’re decorating a room or a whole house, Printcopia can take your photos and turn them into wall-worthy pieces of art. Our easy-to-use print tools make it fun to upload your photos and turn them into stunning prints. Our canvas and acrylic prints offer unique ways to turn your photos into mini-masterpieces. We chose to use one from this year’s holiday photo shoot. ?Here is Thing 3 showing it off as an 11 x 14 canvas from Printcopia. ?We haven’t decided where to hang it yet. 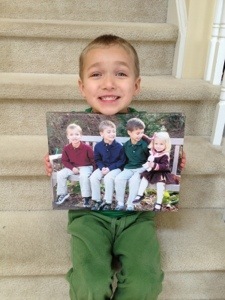 ?If you are looking for a memorable keepsake or gift for the grandparents, give a canvas prints a try. After 9 years and 4 kids, I have learned many essential skills. But there are three which really stand out where I consider myself to be an expert. 1. Changing diapers. Did you read my last post? 30,000 diapers. Enough said. 2. Installing car seats. We used to take the seats to the fire station to have them installed by trained professionals. After watching them do it many to times, car seat installation is something I have mastered myself. 3. Using a plunger. Yes, it isn’t pretty but with 4 kids it has become a necessary skill. I got a glimpse of something today that I’m sure there will be a lot more of. It’s an inevitable part of kids growing up today with so much technology. Thing 2 turned seven years old this week. He has been wanting a Nintendo DSi for a long time and finally got his wish. Thing 1 has had his for a year. But only now, with two in the house, is he getting the full experience. He discovered something called Pictochat. It’s a chat room app that lets you write handwritten messages to other DSi’s in the vicinity. Thing 1 and 2 were going back and forth writing silly messages. Then it kicked up a notch. Thing 1 gave a dare to his brother. He dared him to run to the basement. Naked. He wanted him to streak through the living room and kitchen areas. I’m not sure which is worse. That Thing 1 dared his younger brother to do this. Or, that Thing 2 was fully prepared to do it until I put a quick end to it. I can’t wait to see what they’re like as teenagers. I’m home alone with Things 1, 3, and 4. SuburbanMommy took Thing 2 to his flag football game. It’s Saturday morning, the first 80 degree Saturday since last year, and the Things are very restless. Translation: I need 15 minutes of quiet. Enter the water table. We use it all the time in the summer. It keeps their attention for a long time. But it has been sitting outside all winter and is filthy. The dilemma: Do I let them play with the water table, which means I need to spend a lot of time cleaning while they are trying to “help”, making the cleaning process take twice as long, and I will need to change all their clothes again when they get each other soaking wet and the session ends in a fight-meltdown because water table always ends in a water fight? There are two types of parents: those who give their kids bad stuff to make their own lives easier, and those who say they don’t. Here are some of the things I know may not be the greatest for kids, but I am very thankful for them. And did I mention Wii? Often overlooked this time of year, when we are choosing gifts for our kids, is the amount of work required to assemble the gifts. Last year it was the basketball hoop in the driveway which took 400 pounds of sand to fill the base. Yes, 400 lbs that I had to cart back from Home Depot in 50 lb bags. Then there was this debacle a couple years ago. And with the kids getting older the problem only seems to be growing. 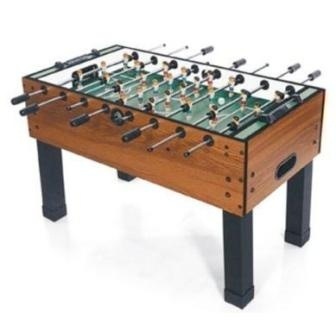 This year I thought it would be good to get them a Foosball Table for Hanukah. But not just any table. I wanted to get one that would last many years, providing enjoyment all the way through high school. Did I mention I was a bit of a foosball aficionado back in the day? I found a table on Amazon. It looked great in the picture and had good reviews. What I didn’t realize, until the guy delivered it on a packing crate, was that it weighed over 200lbs. And there was assembly required. This is what it looks like on Amazon. This is what it actually looks like after you manage to get the 200lb box down the basement stairs. Four hours, 3 finger blisters, and a sore back later, we’re ready to unveil it tonight. Blisters are what happens when you don’t have the electric drill charged and you need to fasten dozens of wood screws by hand. 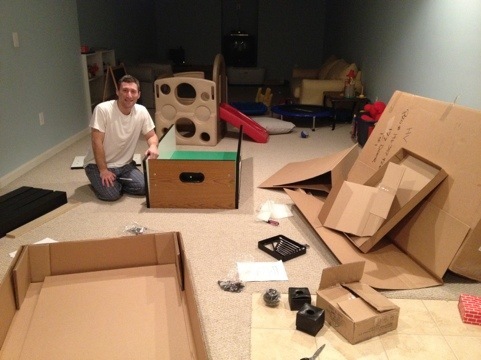 I’m looking forward to the cute deluxe play kitchen I will be assembling on Christmas Eve. This time I will charge the drill ahead of time.